The shop that started it all for me! I'm stoked! A Blast from the past!! This is a picture of the store I worked at for seven years from 1982 thru 1989. Action Cyclery in Streamwood IL. I believe this picture was taken before I worked there. Possibly 1981. Wayne McCallister (the owner) is behind the counter working with customers and that is his father in the isle. This photo brings back memories. 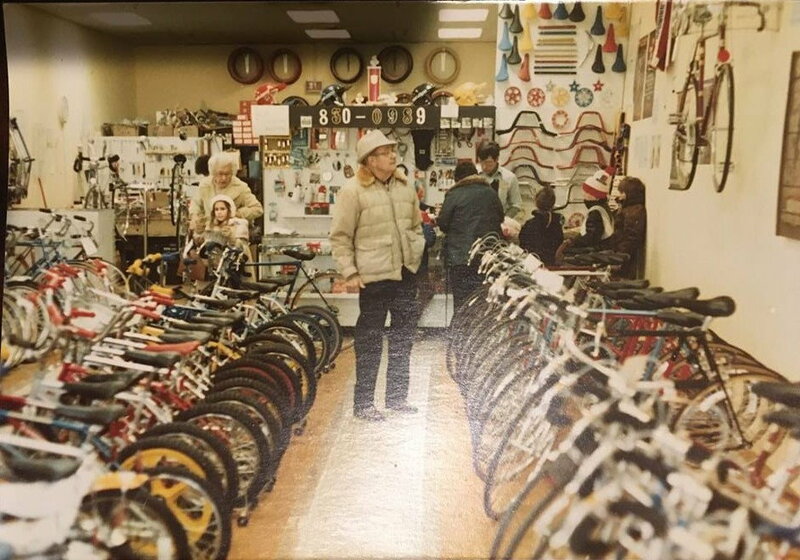 I even see the first make and model schwinn I purchased on the wall on the right! (Schwinn World Sport in Maroon)The same place it was displayed when I purchased a bike there in 81. So cool. Im dying to find more pics. I wish i had a picture of my dad on his Schwinn road bike from the early 90s. It's the only bike I remember seeing him ride. Red reflector on the front of the Schwinn .. looks like they hired you just in time. What's that number board over the counter, with 8 0 - 9 highlighted? ETA is that the phone number? I like the series of backup wall clocks. wall clocks? you mean hanging tires? Looks like a shop that did a lot of BMX. Most of those bikes pictured are probably worth quite a bit of $ nowadays. Great picture. I, too, have fond memories of the bike shops I either frequented (UCLA area C. Harding's For Bikes, Rancho Park Cycles, etc.) or worked in (greater west Los Angeles area Bikecology chain, 1972-74 -- Santa Monica, Pacific Palisades, Marina del Rey). Limited in floor space while desiring to stock everything customers needed, these stores, like the one in your picture, used every square inch of wall space, and some ceiling space, as well. I always liked the old freewheel cog pegboards, since I was -- and still am -- a gear phreak. First thing I noticed too. Looks like a lot of cool stuff and money on those walls. Cool, now that is how to stock a bike shop! I feel you, jjhabbs. Now, officially old having exceeded my Biblical expiry date, I find myself reminiscing about days of old, which for me are memories now. Pictures, such as the one you presented are in keeping with memories of days gone bye. Great picture and thanks. Aero Levers for small-handed person?